Taughannock Falls State Park near Ithaca, New York taken on March 23, 2014. Nikon D700/24-120VR, f/16, ISO 200, EV 0, 32mm focal length, HDR image. Spring arrived last week as the Vernal Equinox occurred. Problem is Nature is far from done with winter weather in upstate New York. 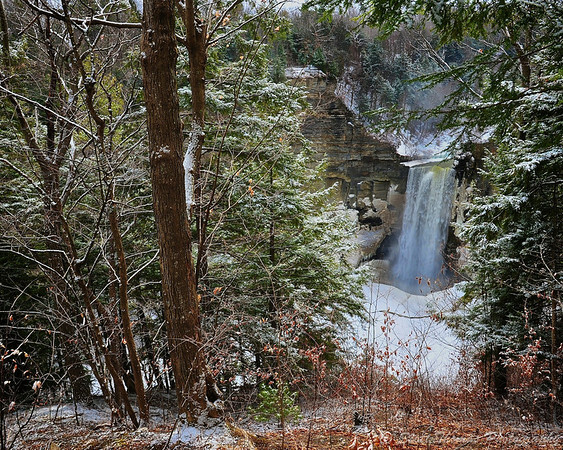 I drove in and out of snow flurries on my trip down to Taughannock Falls State Park near Ithaca, New York. The falls were flowing well and even the ice around the plunge pool was starting to break up. The cold air temperature required me to wear a heavy winter coat and winter photography gloves. The trek up to my favorite view of Taughannock Falls was icy and treacherous. The view calming. It has been a long winter and the sound of the falling water, crisp air on my face and smell of life about to be renewed was something needed. Yes, Spring will come as it has for thousands of years….in its own good time. This entry was posted in Nature, Weekly View and tagged 24-120mm, hdr, ice, ithaca, new york, nikon D700, photomatix pro, snow, spring, state park, taughannock falls, vr, water, waterfall. Bookmark the permalink. Very nice composition and I also like the colors; subdued but with a bit of reddish brown pop in the foreground. Such are the colors of Late Winter and Early Spring. Should Spring arrive, the growth and colors will follow. Thank you, Bernie! Hope your Spring flowers bloom soon. Oh I do hope so. For now I’ll just come over here and have a look . . . Thanks, Gerry. It sure has been one long winter. Now if you could just get a shot of that without the snow, right? I’m sure it was an invigorating walk. This weekend has me believing that spring really is arriving, though winter sure did drag its feet this year! beautiful! Been there recently! Love waterfalls!